Our new website is live – its morphed from being understated and bijou to a funked up, glamorous and if I may say so myself a veryÂ happy hunting ground of quirky individualism. You will find paintings which double up as storage units, beautifulÂ felt rugs, scented candles, tons of vases, furniture, lighting that makes you look younger and of course our fabulous faux flowers. 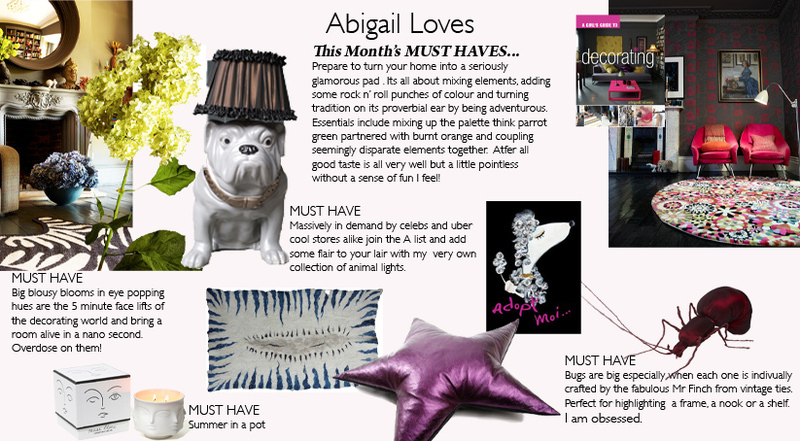 There is also a page of all my latest loves – updated each month plus this week we are getting super professional and updatingÂ our Facebook page whereby we will be running competitions (think gift vouchers worth zillions,Â orÂ an hour of my time also worth zillions I have to say), insider tips, inspirational stuff and everything to do with making your pad fabulous. We are not quite up to date with all our press pages we have had such amazing coverage that we are still scanning in as we speak all the historical stuff – so please bare with us on that frontÂ (all should beÂ sorted by the end of the week).The interior design section has been updated,Â images of the store aboundÂ oh and if you are a trade customer wanting to stock our lights – all the details are on line.